Ottawa and Washington, D.C. — The Council of Canadians and Food & Water Watch are sounding the alarm over TransCanada’s speculation that the Keystone Pipeline could potentially be used for bulk water removals from the Ogallala aquifer. TransCanada pipelines operations director Jim Krause testified at the Nebraska state assembly earlier this year that the proposed Keystone XL Pipeline could be used in the future to mine or transport water, potentially from the Ogallala aquifer. 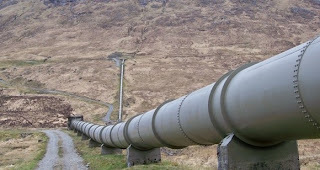 Krause is quoted as testifying that, if approved, the pipeline would only be decommissioned “if the pipeline is not needed for oil somewhere down the road and there is no other use for any other product to go through that pipe, let’s say gasoline, or maybe by that time in the future, water” [emphasis added]. The Council of Canadians and Food & Water Watch say this adds to a growing list of concerns regarding the pipeline project, which threatens to contaminate the Ogallala – one of the world’s largest supplies of freshwater. “It’s widely recognized that the Ogallala, which serves as the breadbasket of the U.S., is already in dire straits. The fact that pipeline proponents are already considering using the Keystone pipeline for water proves just how irresponsible this project is in its entirety,” says Wenonah Hauter, Executive Director of Food & Water Watch. Barlow will represent the Council and Food & Water Watch in Washington, DC at the end of the month to support what is being called the largest collective act of civil disobedience in the history of the climate change movement. Over 2000 people have committed to participate in a daily series of peaceful protests from August 20 to Sept 3rd, which for some participants will involve risking arrest, aimed at discouraging President Obama from approving the Keystone pipeline. This entry was posted in Pipelines, Water & Food and tagged Pipelines, Water & Food. Bookmark the permalink.